9 Simple Shaving Tricks For Smoother, Softer Skin! One of the quickest, most convenient, and cheapest ways of getting rid of annoying body hair is shaving. But before you pick up that razor, here are some shaving hacks you should know. These will make getting rid of all that fuzz much smoother! Hanging out in the shower or the bath for a couple of minutes before you start shaving helps soften the skin and open up pores, allowing a closer shave. The steam in the shower/bath open up the pores and loosens the hair follicles, making it easy to get a smooth finish without damaging the skin. Exfoliating before a shave removes the dead skin cells and softens the skin, providing a buffed and polished base for the razor to do its job. The result is completely fuzz-free and polished skin. Skip the post-shave scrubbing as it may irritate your skin. As a general rule of thumb, swipe in the direction of the hair growth, followed by a swipe in the opposite direction. Skip the opposite direction step if you have sensitive skin. A gentle and creamy shaving cream provides a cushion for the razor and promotes a friction-free slide, which means less irritation, redness and itchiness. In emergency situations, when you’ve run out of shaving cream, a thick shower lather, a creamy hand wash or any conditioner will do the trick just fine! It may be tempting to swipe and re-swipe the razor in the hopes of a smoother finish but resist the urge to do that. It may irritate your skin by causing redness, itchiness or dryness. A single swipe with a fresh, multiple-blade razor without too much pressure should do the trick. 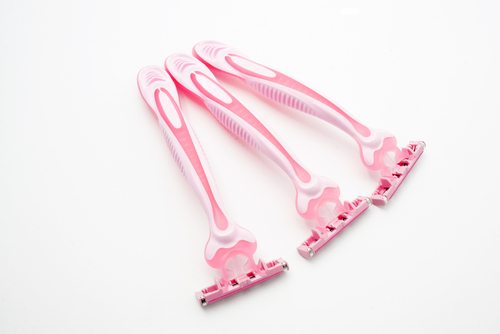 Razors designed specifically for women often have moisturising strips, angular heads and protective cushions which ensure a nick-free shave. They are designed to angulate themselves to suit various body parts. Opt for these over the regular disposable ones to make this annoying routine a bit more bearable! Using long strokes may seem efficient but the result isn’t nearly as precise as when you use small strokes with light pressure. It may take a little bit longer but the result will be better and will last longer. Post shaving, using a body oil seals in moisture and gives the skin a glossy finish. Your skin is bound to feel a bit dry after an intense exfoliation and a shave, which is why it is crucial to compensate by giving it some moisture to avoid a scaly, dull appearance. Apply the oil on damp skin to make sure it absorbs well and leaves a dewy finish. Using a dull blade means you have to go over each area a couple of times, resulting in skin irritation. Using a blade thrice would dull it enough to not give you the same effect as a fresh one would. Do your skin a favour and replace after a maximum of three uses! Images: Shutterstock HAVE A STORY IDEA FOR POPxo? If you want to hear about it, we can write about it! Just tell us your idea here! MUST-READ: Bikini Wax Virgin? 8 Things To Know Before Your First One! MUST-READ: The Step By Step Guide For Shaving Your Hair “Down There”!